A new GameStop promotion is polishing up a trio of legendary Pokemon for elite trainers only. Nintendo might be changing its focus to Pokemon Black & White, but it hasn't forgotten about the previous DS Pokemon entries just yet. The month of January will see a promotion hosted at GameStop that features the giveaway of not one, not two, but three legendary Pokemon, and they're shiny to boot. 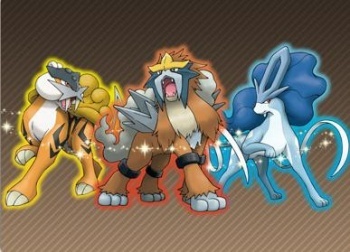 The Pokemon to be given away are shiny versions of Raikou, Entei, and Suicune. Shiny Pokemon are a color variant of regular Pokemon that usually have a sparkling animation and sound effect associated with them. Finding one is basically like buying a dog and discovering he can also play basketball. In the case of this GameStop promotion, the shiny Pokemon will know new moves not normally available to them. Unfortunately, none of the three will be wearing peach-colored backwards hats. Shiny Raikou will be able to take advantage of the weather by using the Weather Ball move, shiny Entei can burn its opponents with the Flare Blitz, and shiny Suicune can use Sheer Cold to land a one-hit knock out (if lucky enough). All three will also have the ExtremeSpeed move, which inflicts damage with increased attack order priority. You're going to want these Pokemon if you plan to get Pokemon Black & White, because transferring them to the upcoming titles will give players a chance to catch a Zoroark, which is apparently not available through regular gameplay. Shiny Raikou will be available at participating GameStop stores from January 3-9, shiny Entei from January 17-23, and shiny Suicune from January 31 to February 6. Players must have a pure heart and Pokemon Diamond, Pearl, Platinum, HeartGold, or SoulSilver to pick up these shiny beasts.